The 2019 Maryland Orchid Society Show and Sale will be held in the Main Building at Timonium Fairgrounds. Some may know it as the Cow Palace. Our sales and exhibits will be centrally located, set up adjacent to the food court. The Show runs from Friday, March 8 to Sunday, March 10, 2019. Thursday, March 7, 2019 8:30 a.m. (begins) AOS judging, Main Building. your 2019 Exhibitor Information (click) here. 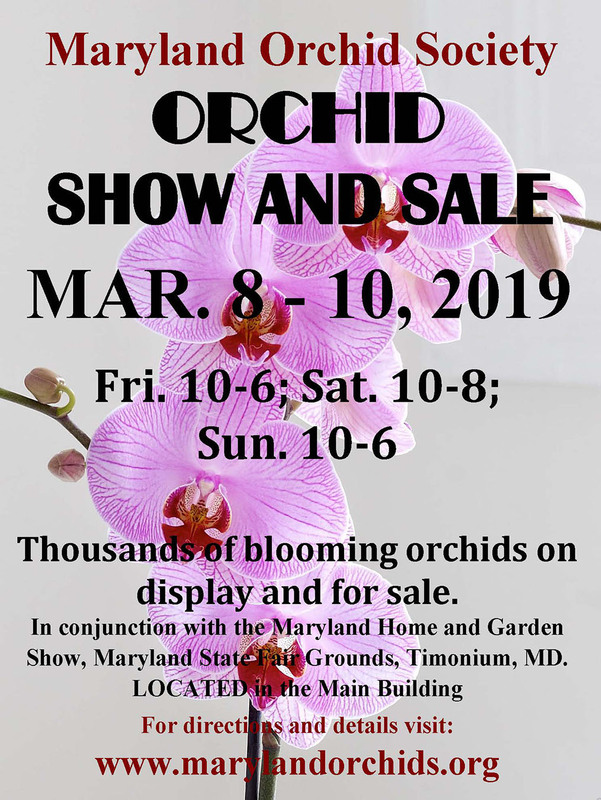 The sales area will feature the finest seedlings and flowering plants from hardy terrestrial orchids, to rare species, to the latest hybrids. From the Baltimore Beltway (I-695), take I-83 north. Exit at Timonium Road EAST. Turn left on York Road. Turn left into the Fairgrounds at the North entrance. Free parking is plentiful. Follow the crowds to the Main Building.